Summary: Based on analysis of eBay sales of men’s shoes during the period of July-Dec 2015, list your auction item to end between 4:00pm to 8:00pm Pacific time. Avoid the period of time between 9:00pm to 6:00am Pacific time. Sunday is the best day of the week. There are quite a few articles on the web about the “best” time to sell on eBay. Its of interest because obviously sellers want to get the most money from whatever they are selling. And that’s why you are reading this, right? I have been collecting eBay transactions on men’s shoe sales for a little over 6 months now. I have been using the data to search for … guess what … shoes. 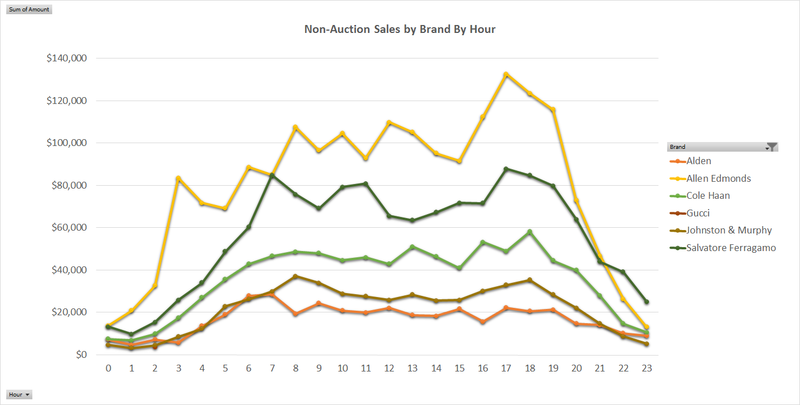 Since I had this data, I decided to see if I could find the “best” time to end an auction. 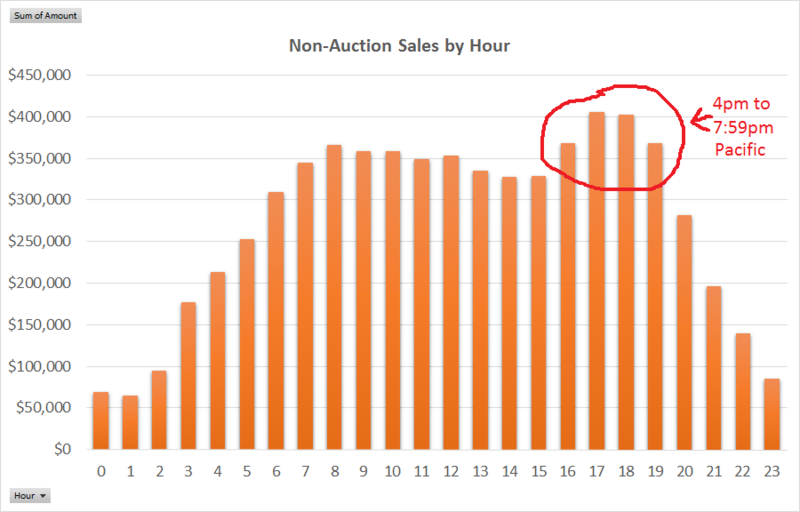 At first, I looked at auctions and tried to figure out what day/hour had the highest percentage of auctions ending with a sale. This query came back as 2AM. Looking at the data though, 2AM had the third lowest count of sales. This result was “suspect” as a friend of mine might say. Next I decided to look at when people were spending the most money. I didn’t have data though on the day/hour of auction bids (someone could bid at an hour well before the auction ended), so I decided to exclude auctions and just include fixed price and “buy it now” sales. That’s right, I am finding the best time to end an auction without considering auctions. Another item to note, I did not include all men’s shoes but just counted the combined sales of the most popular men’s dress shoes – Allen Edmonds, Gucci, Ferragamo, Alden, Cole Haan, and Johnston & Murphy. And included only listings with one item (i.e. a single pair of shoes). 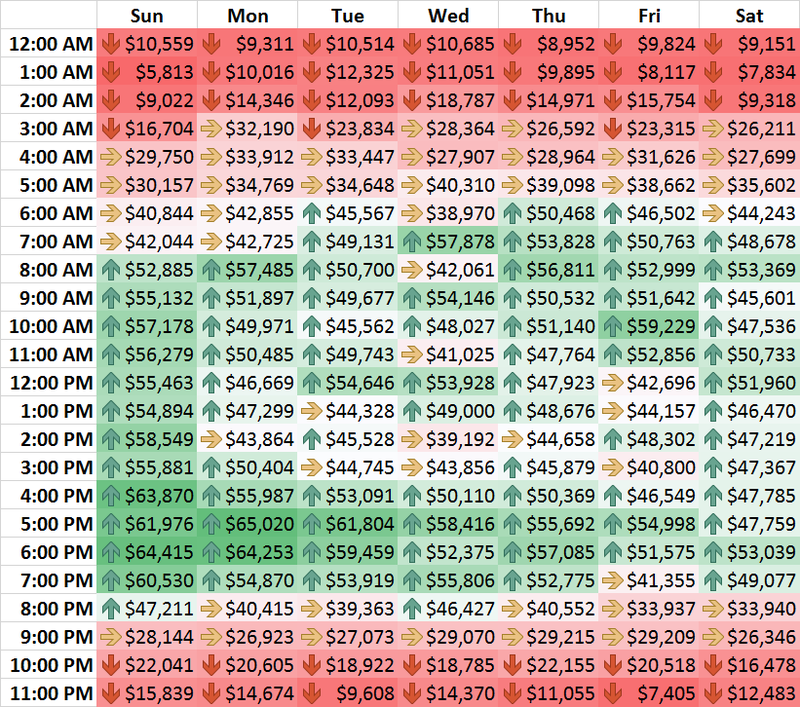 This set of queries revealed money being spent during daylight hours and peaking between 4PM and 8PM Pacific. See the first chart above. This correlates to 7PM to 11PM Eastern time which makes a lot of sense and is similar to findings in other articles. Grouping the data by day of the week, it showed that Sunday was the day most money was spent but the day to day changes weren’t as significant as changes by hour. See the chart below. 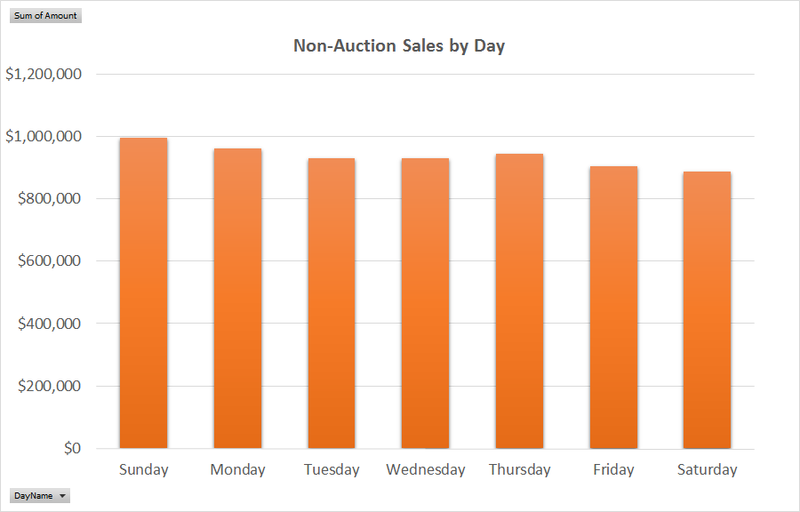 So you should be able to have a successful auction any day of the week. Below is a heat map merging the hour and day results into one chart. Green up arrows indicate good hours to end an auction. Avoid the red times. I don’t have an entire year of data but during that last four months of 2015, there was variability in the money spent week to week with lower amounts of money being spent Labor Day week and New Years week. Thanksgiving week had the most money spent. This chart is just a variation of the first chart where I broke out the data by brand. 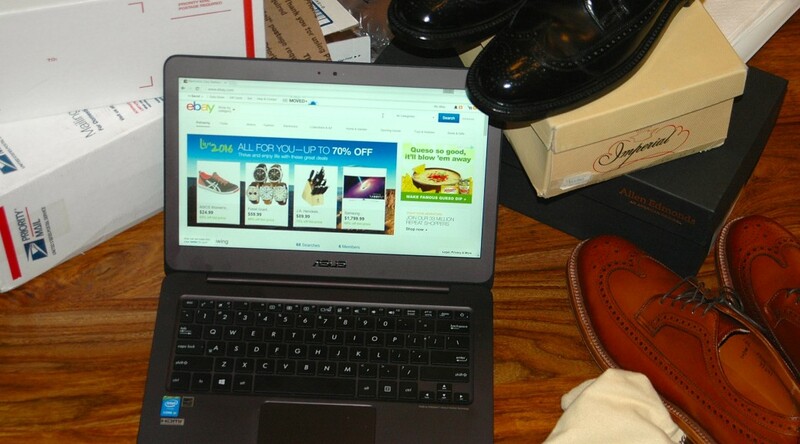 Do the results for men’s dress shoes correlate to other eBay categories? Maybe or maybe not. Its just the data I have. I am interested in looking at when are the most successful auctions. Auction success to me is getting a higher than average price for an item. Next time. Comments? Issues? Problems? Questions? Let me know. 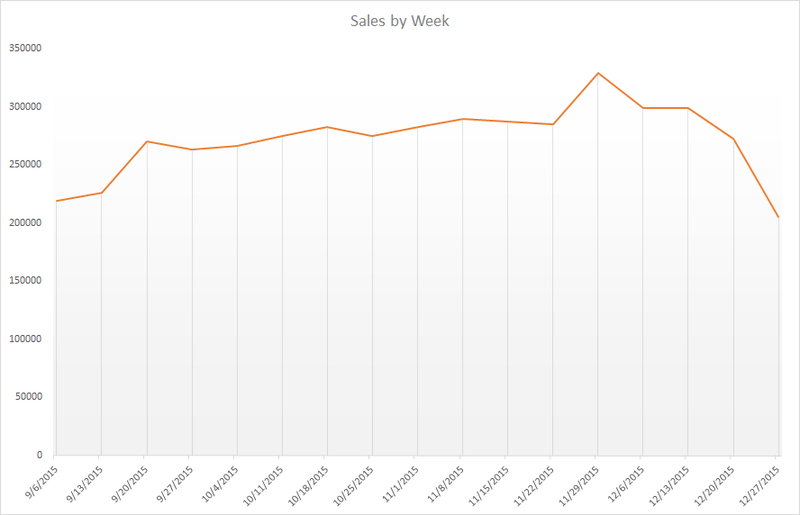 Does your time vs. sales chart correlate to Pacific Time or EST? This does make a huge difference because eBay’s clock is set to Pacific.